LIZ VISITS SIX(!) SEED GRADS AT OLD DOMINION UNIVERSITY! This is the third installment of SEED's College Transition & Success tales from the road, where our advisors give a first-hand account of a day in the life of a College Outreach Visit. Scroll further down our blog to see earlier adventures! 9:00am: Kicking off at Old Dominion University! Good morning SEED family! My name is Ms. Middleton, and I am a College Success Advisor with the College Transition and Success (CTS) team at SEED. Thanks to my fellow Advisors Mr. Frasier and Ms. Weiss for sharing their campus visits over the past two weeks! Today, I'll be sharing with you my visit to Old Dominion University in Norfolk, VA to visit 6 SEED graduates - first-years Diamond, Johnae, Misty, Sakari, and Zhane' (SEED DC '17) and junior Sherrick (SEED DC '15). I'll be attending classes, visiting with on-campus support services, and catching up with our grads, so stay tuned for more updates! I'm spending the first part of my morning with Sakari, a first-year student and nursing major at ODU. After attending her Intro to Dance class (where she made me promise not to take any pictures), she introduced me to the folks at ODU's Student Success Center. Sakari, along with our other SEED grads, participates in the Student Support Services and TRIO programs on campus. These provide students with academic advising, mentors, tutors in every subject, personal development workshops, and sometimes even financial support. I am thrilled all of our SEED grads are involved with Student Support Services at ODU! 12:00pm: Time to hit the books! I'm now on to English class with Diamond, another first-year student who is considering a major in Criminal Justice. Diamond gave me a quick campus tour and pointed out the Writing Center and Tutoring Center, which are conveniently located in the library. She has used both of these resources already for her classes and has found them very helpful. I'm happy to see that ODU offers strong academic supports, and that our grads are taking advantage of them! 2:00pm: Gotta love a dorm with a view! Meet Misty, another first-year at ODU who is considering majors in English and Philosophy. Misty and I caught up outside of her dorm and enjoyed this beautiful view behind us. All five of our first-years here live in the same section of campus, so they see each other and spend time together often. There is even a dining hall conveniently located in Misty's dorm where they can share meals. Now that she feels settled, Misty is looking forward to getting involved in more clubs on campus, such as Anime Club and organizations for students who like to write. I snapped this quick picture of Zhane', another first-year at Old Dominion, while she was playing tour guide and showing me all the places on campus where she spends her time. 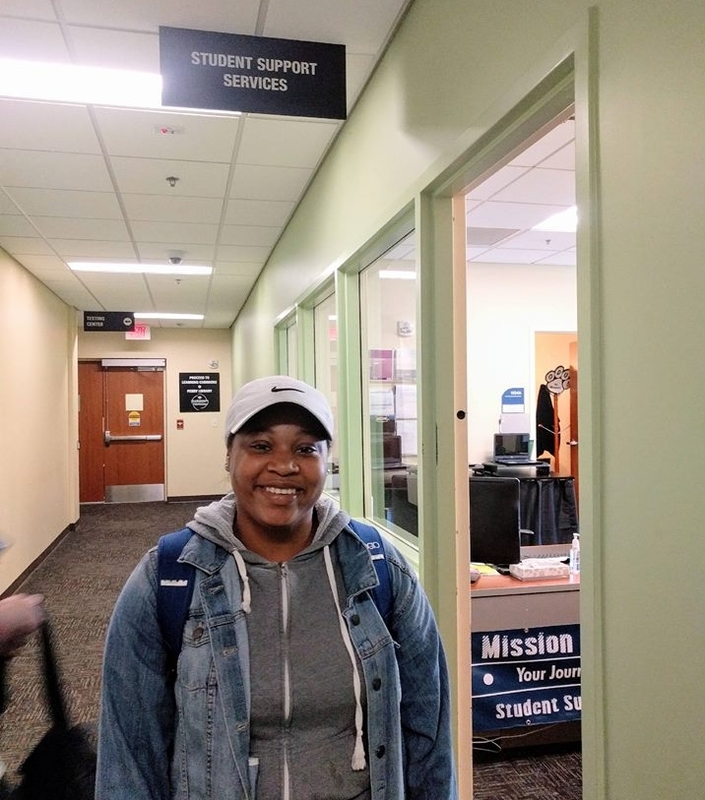 In between classes and attending Student Support Services/TRIO programming, Zhane' works in the recreation center, where she helps in the back office with paperwork and data entry. Her supervisor appreciates how efficiently she works! We made a quick stop to grab some food, and Zhane' headed off to work, all dressed up in her uniform of ODU gear. Thanks for the tour! I spent some time with Johnae between her classes and the many activities she's already involved with at ODU. In addition to working with TRIO, Johnae is a member of the ODU Women's Club Volleyball team as well as an on-campus choir group! She has enjoyed all of her activities and feels like Old Dominion is the perfect fit for her. We took some time our of her busy schedule to catch up and fill out her FAFSA for the 18-19 school year, which opened on October 1. I am excited to see Johnae involved in so many activities that bring her joy! It's our last stop of the day - dinner! After a busy week, everyone is excited to get off campus and have dinner with friends. It's been great visiting these young ladies and seeing how well they are doing at college already. Thanks for following, and stay tuned for another CTS social media takeover soon!